Located close to Umm Suqeim Beach, Jumeirah Beach Hotel offers luxury accommodation overlooking the Arabian Gulf and an onsite marina. Home to an outstanding range of onsite facilities, the hotel is just a short drive from the Dubai International Airport and 10 minutes from sister property Jumeirah Hotel. The hotel also offers easy access to a variety of local activities and attractions including Souk Madinat Jumeirah, Ski Dubai and the onsite Wild Wadi Waterpark. Boasting its own private beach, the hotel also offers access to an excellent range of shopping and dining options. Accommodation at Jumeirah Beach Hotel offers a choice of luxury rooms, suites and villas, complete with air conditioning, premium bedding, complimentary bottled water, Cable TV, free WiFi, tea/coffee maker, minibar, desk, in-room safe, complimentary newspaper and private bathroom with separate bath, rainfall shower, bathrobes, slippers and hairdryer. 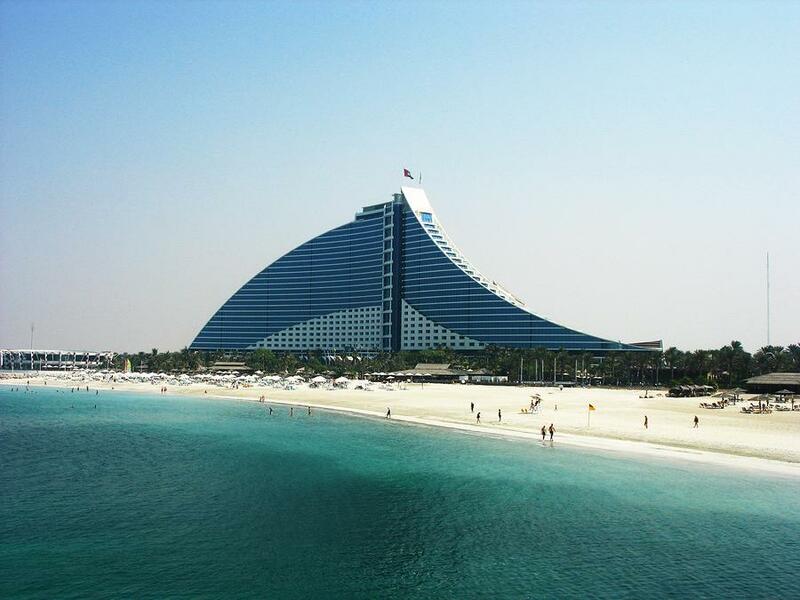 Each room enjoys views of the ocean, Arabian Gulf, marina and Burj Al Arab. Some rooms also feature their own private plunge pool. Jumeirah Beach Hotel is also home to an outstanding range of onsite facilities including swimming pools, plenty of dining options, a kids club, full service day spa, climbing wall and much more. The rooftop lounge offers incredible views of Dubai while the swim-up bar means you never have to leave the luxurious pool to enjoy refreshments. The hotel is also home to a private beach, onsite marina, tennis courts, a state-of-the-art fitness centre and a tour desk to assist in arranging a variety of activities and attractions. Accommodation at Jumeirah Beach Hotel offers a choice of luxury rooms, suites and villas. Ocean Superior Room: Floor to ceiling windows offer views of the Burj Al Arah Jumeirah, Arabian Gulf and beach. Offers a rain shower and free standing bathtub with double vanity the bathroom. Some offer a private balcony. Room size is 50m². Bedding is 1 King Bed OR 2 Twin Beds. Ocean Deluxe Room: Features a separate walk-in shower and separate bathtub. Offers uninterrupted views of the Burj Al Arab Jumeirah, marina and ocean. Some offer a private balcony. Room size is 50m². Bedding is 1 King Bed OR 2 Twin Beds. Ocean Superior Club Room: Floor to ceiling windows offer views of the Burj Al Arah Jumeirah, Arabian Gulf and beach. Offers a rain shower and free standing bathtub with double vanity the bathroom. Enjoy access to the Premium Leisure Club or The Club Executive. Room size is 50m². Bedding is 1 King Bed OR 2 Twin Beds. Ocean Club Room: Features a separate walk-in shower and separate bathtub. Offers uninterrupted views of the Burj Al Arab Jumeirah, marina and ocean. Enjoy access to the Premium Leisure Club or The Club Executive. Room size is 50m². Bedding is 1 King Bed OR 2 Twin Beds. Junior Ocean Suite: This spacious suite offers a separate sitting area from the bedroom, private sun terrace with stunning views of the hotel marina and Arabian Gulf. Enjoy access to the Premium Leisure Club or The Club Executive. Room size is 105m². Bedding is 1 King Bed. 1 Bedroom Ocean Suite: Features a separate living room from the bedroom. The floor to ceiling windows offer views of the iconic Burj Al Arab Jumeirah, ocean and marina. Enjoy access to the Premium Leisure Club or The Club Executive. Room size is 128m². Bedding is 1 King Bed. 2 Bedroom Superior Suite: Offers a modern bathroom with walk-in shower and separate bathtub and scenic views of the marina and Burj Al Arab Jumeirah. Enjoy access to the Premium Leisure Club or The Club Executive. Room size is 162m². Bedding is 1 King Bed + 2 Twin Beds. 2 Bedroom Ocean Suite: Ideal for small families requiring extra space and privacy, this suite offers a separate lounge room. Enjoy access to the Premium Leisure Club or The Club Executive. Room size is 160m². Bedding is 1 King Bed + 2 Twin Beds. 3 Bedroom Ocean Suite: Great for small groups travelling together, this suite offers a separate lounge room and private balcony with stunning views over the Arabian Gulf. Enjoy access to the Premium Leisure Club or The Club Executive. Room size is 215m². Bedding is 2 King Beds + 2 Twin Beds. Family Garden Suite: These beautifully designed suites are located on the ground level for added safety when travelling with children. Features a private terrace and close to the leisure pool. Enjoy access to the Premium Leisure Club. Room size is 148m². Bedding is 1 King Bed + 2 small Twin Beds. Royal Villa: The exclusive 1 and 2 Bedroom Royal Villas offer a private terrace with plunge pool and views of a garden or the Arabian Gulf. The spacious bathroom is 18 Carat gold plated with a sunken circular bath. Enjoy 24-hour dedicated butler service. Room size is 130m². Bedding is 1 King Bed. Home to some of Dubai’s best restaurants and world renowned chefs, the hotel offers a huge range of bars, lounges and restaurants. Each restaurant offers its own unique setting and menu including fine dining experiences, casual fare and family friendly options. Cuisines include authentic Latin American, contemporary Indian, Italian, Pan-Asian and British. Talise Spa: Unwind with massage treatments, facials, aromatherapy, reflexology, shiatsu and Swedish massage in the deluxe spa facilities including massage rooms, saunas, hot tubs, a Jacuzzi, steam room and plunge pool. Suited to children aged 2-10 years old, this Kids Club offers a range of activities to keep the little ones entertained. Activities include face painting, bowling, crafts, sports and more.